Curb appeal and concrete curbing at a huge hotel. 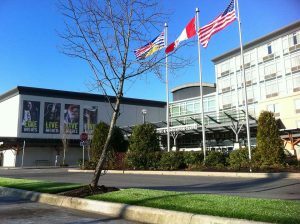 Large project at hotel & conference centre with artificial grass - Curb Design Inc.
One of our larger landscape design projects. This project was part of a huge hotel and conference center. This project included concrete curbing and curb appeal. Big green lawn with Canadian flag and Untied States of America Flag.